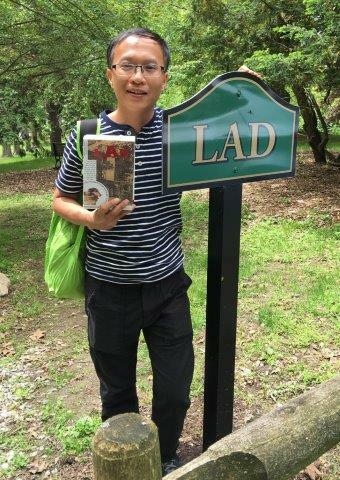 Sunday, May 22, the same day President Obama was in Vietnam, the Van Riper-Hopper House Museum was hosting a tour for an up-and-coming literary figure from Hanoi, Vietnam. Vu Danh Tuan has written the first translation into Vietnamese of Albert Payson Terhune’s Lad: A Dog. When asked how he came to know about Terhune’s collie stories, Mr. 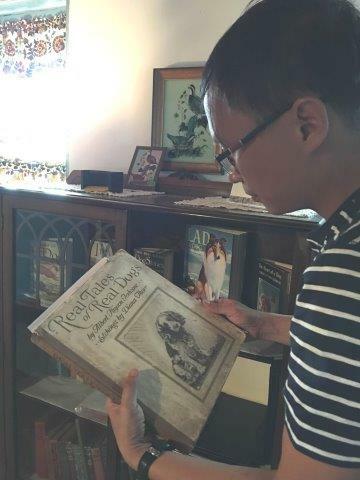 Vu Danh Tuan said, “Through collecting antique books.” He bought a copy of Lad: A Dog, written in 1919, and loved reading it. He also said that the story is very popular in Vietnam. He was most interested in seeing photos and visiting Sunnybank, Terhune’s former home site in Wayne, NJ. One of Tuan’s favorite spots was the grave of the dog Lad. In the photo he is holding a copy of his book written in Vietnamese next to Lad’s gravesite. At the Van Riper-Hopper House Museum he looked through albums of Terhune photos and enjoyed the artifacts in the Terhune Exhibit Room. Vu Danh Tuan is also CEO of a travel agency, YouTrip in Vietnam, and he and his wife Hang have been to the USA more than once. If Albert Payson Terhune’s dog tales continue to be popular in Vietnam, more Vietnamese people may soon be visiting Sunnybank in Wayne, New Jersey. Terhune Memorial Park - Sunnybank overlooks Pompton Lake at the edge of the Ramapo Valley. It is a 9.6 acre tract of pre-Revolutionary oaks tended to with loving care by Albert Payson Terhune and his wife Anice Stockton Terhune (1874-1964). The "spell" of Sunny bank can be felt underfoot as one walks the grounds of Terhune Memorial Park. Empty of the Sunnybank collies and the Terhunes, there is still an Edenlike quality to the grounds. Visitors can view the securely displayed Terhune Collection of books and collie dog awards at the Van Riper-Hopper Historic House Museum. The Terhune Memorial Park – Sunnybank is owned and maintained by the Wayne Township Department of Parks and Recreation. This land, originally part of the Arent Schuyler crown grant of 1695, contains a direct link with all of our American Revolutionary past. During the bitter winter of 1777-78, the Van Cortlandt Regiment encamped in the Sunnybank meadow. The Reverend Edward Payson Terhune who purchased the land in the late 1860’s found the relics of an American officer who had been buried with a captured British officer’s sword with initials EL scratched on the stock. The sword had once been on display in the Pompton Lakes Library. Young Bert Terhune, while hiking in the nearby Ramapo hills, found Hessian shackles and rusted cannonballs. These, and other artifacts found by the Terhune family, can be found in the Pompton Lakes Historical Museum. THE GROUNDS – "The Gardens from Everywhere" Wisteria and woodbine surrounded the old Victorian mansion. Weeping willows transplanted by the elder Mrs. Terhune from cuttings brought to Olney, the Virginia home of Bert’s mother in 1693, were planted by the edge of the lake. It was Marion Harland, the elder Mrs. Terhune’s pen name, who wrote of naming Sunnybank. She saw, "a shimmering sunset lake and a natural stretch of shining green lawn." She wrote cookbooks and books about etiquette, music and travel. A talented musician, Bert’s wife Anice wrote an opera, "Nigros". Bert and Anice planted all their lives. Chestnuts to replace the 1903 blight which cost Sunnybank 120 shade trees, Siberian elms, tulip poplars, maple, elm, fruit trees, dogwood, locust and many others. In the beautiful wooded areas of Sunnybank, quail, partridge and songbirds of all description made the estate truly a preserve, an Eden in retrospect. Lad, and all those Sunnybank collies who have been the subject of perhaps thirty books by Terhune, lived out their days within the walls of this estate. Gallant Lad, "a thoroughbred in body and soul", is buried under one of his favorite shady spots near the driveway. Lad was not a show dog, but, in 1916 at the age of 12 years he won a cup at a Fourth of July dog show in Hawthorne, the only show he ever entered. Bruce, buried above Lad’s grave in the terraced area where roses once bloomed in profusion, was a magnificent specimen. Jean, his favorite companion, killed by a careless motorist who disregarded the signs requesting privacy, is buried with Bruce. Bruce, "the dog without a fault", was Champion Sunnybank Goldsmith and sired many beautiful Sunnybank puppies, many presented as gifts by area parents at Christmastime. "At a boulder in the woods of the Terhune estate Wolf lies at rest." Thus, the new York Times remarked on the passing of the brave collie who died on the railroad tracks in Pompton Lakes trying to save a mongrel. On June 28, 1923, the obituary of Wolf was a story printed in newspapers from coast to coast. Champion Rock is surrounded by the graves of the four other Sunnybank champions. Chs. Sigurd (Treve), Explorer, Thane and Sigurdson guard Wolf’s grave. Other famous names can be read on the simple headstones. Fair Ellen, Gray Dawn, Bobby and there is even a marker for Tippy, a fifteen year old cat. Other Sunnybank collies lie at rest in this area near the frog and goldfish pond where Terhune often sat and reflected on the beauties of nature. Jock, Bobby, Buff and Sandy are a partial list of his favorites. Rex, qualifies as the "ghost" of Sunnybank. This powerful cross-breed guarded the front door of the house and was seen by three visitors to Sunnybank who were each unaware the dog was dead, and also were unaware any others had seen Rex. Jack the frog was an inhabitant of the pond for twenty seasons until his body was found on the road. Terhune does not forget the other animals. Sunnybank’s Little People include cats, birds, squirrels, Fritz, the horse and even a milk cow. Cecil B. DeMille and young Bert dueled each other as playful companions in their youth. Sinclair Lewis and other literary figures visited the "big guy from Pompton" at Sunnybank. Purchased by the Township of Wayne with the aid of Green acre funds, the park is a valuable addition to the community. In use at the present time as a cultural center for art shows, collie competitions, fairs and other outdoor events, the improvements represent the long rang plans of many groups all under the Wayne Department of Parks and Recreation. The Citizens for Sunnybank Committee, the Collie Clubs of America, many community groups such as the Women’s Clubs, the Junior Chamber of Commerce and the Albert Payson Terhune Foundation are all involved in a joint effort to make Terhune Memorial Park a beautiful example of nature’s best. Inside the pages of all the Terhune writings, the land that was Sunnybank is preserved forever.